Lately, I’ve been forgoing my usual red lipsticks and berry shades for something a bit lighter and longer wearing. It’s easier for me to not have to worry about smudging or reapplication when it’s going to be a long and warm day at my office. 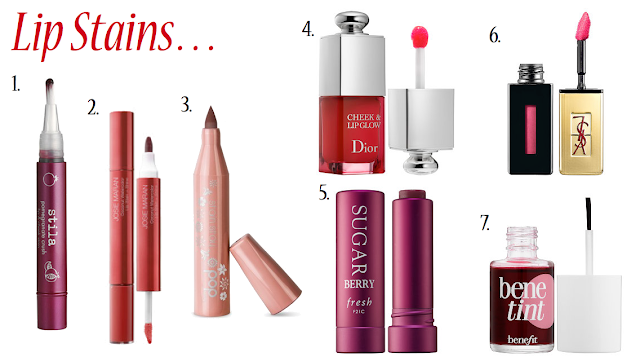 So lately, I’ve been playing with a ton of lip stains to find my favorite shades and scents. During Summer, I love to go a bit lighter on all my makeup to give myself a more natural look that will stay put throughout the day and finding the perfect lip stain is definitely a big part of that! Check out some of my favorites below. You have some great picks here! I like using lip stains and glosses as my allergies agree more with them than lipsticks! Berry shades are my go to all year long. Love your picks.